The Skinny: A welcome blast from the past that gets submarined by lousy execution. Bet to Basic has the goods to be funny, or at least marginally diverting, but it doesn't pull it off. If only Wong Jing had worked on this movie. The lack of mahjong movies getting you down? Then Bet to Basic may be for you. Nostalgia seekers might enjoy this cheap, Wong Jing-less gambling comedy, as it channels the old-time charm of Hong Kong gambling films better than, say, the Kung Fu Mahjong movies. That doesn't mean the movie is necessarily good, however. 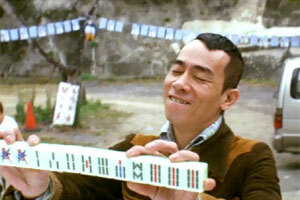 Jordan Chan is Lloyd, a dopey gambling savant who possesses the uncanny ability to always draw a winning, though usually wimpy hand in mahjong. You see, there are numerous ways to win in mahjong, usually involving consistent suits or special combinations, but a person can still win with a hodgepodge of mismatched tiles. The ability to come up with the latter is Lloyd's ability, which makes him a minor terror on the mahjong circuit. End mahjong lesson. Cousin Flying Dragon (Chin Kar-Lok) enlists Lloyd to help win in gambling dens, but the duo is soon drawn into a gambling rivalry straight out of those sixties Shaw Brothers gambling films. Mahjong master Scott (Eric Kot) is looking to take down his longtime rival Yuen (Yuen Wah), and enlists the aid of his apprentice Morpheus (Samuel Pang with wacky fake eyebrows). Meanwhile, Yuen has his own apprentice, Peggy (Rain Li), who joins her master for a face-off during a cheap-looking King of Mahjong competition. Lloyd and Flying Dragon are initially just witnesses, but back-stabbing and sudden twists of fortune tear everything apart. Flying Dragon gets beaten up, and soon Yuen is asking for Lloyd's help to take down Morpheus in a final King of Mahjong competition. That this new King of Mahjong competition seems to be the second one in less than 2 months is irrelevant; Lloyd begins training to be a true mahjong master. Sadly, he seems to have lost his ability to draw winning hands. Can he get it back in time for the big face off? I'll give away the ending: he does, and the good guys win! Unfortunately, Bet to Basic is directed in such an uninteresting manner that you may not care who wins. The film possesses the tools to be a fun retro-HK Cinema experience, but director Paul Chung and company only capture part of the fun, and absolutely none of the energy of Wong Jing's early-nineties classics. The setup is there; Bet to Basic comes complete with a betrayals and loaded mahjong face-offs, and even has amusing training sequences (check out the "tofu mahjong") and a wacky musical number set to a Sam Hui oldie, with Yuen Wah and Eric Kot in obnoxious afro wigs. But the energy is gone. The musical number features limp choreography and boring montage, and the rest of the film's drama is handled in an equally mind-numbing manner. The sets and cinematography are noticeably cheap, and many of the jokes are simply not that funny. Bet to Basic also has no action. Hell, just thinking about the movie puts me to sleep.